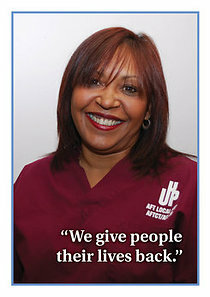 AFT Connecticut is the largest union of acute care hospital workers in the state, representing approximately 10,000 nurses and allied health professionals. The labor federation's members work in 10 of the state’s hospitals. From securing strong contracts to establishing safe staffing requirements, AFT Connecticut works to improve working conditions for all healthcare workers and provide its members with career training and professional development. Click here to hear nurses at Backus Hospital in Norwich on the 5th anniversary of forming their union reflect on what they have won for their patients and their profession. Healthcare Workers at Rockville General Hospital Vote for "Voice to Assure Quality Care"
Vernon - The majority of a diverse group of healthcare professionals at Rockville General Hospital (RGH) today voted for union representation in a National Labor Relations Board (NLRB)-supervised election. The outcome is a win for the bargaining unit of approximately 150 nursing assistants, maintainers, unit coordinators and others at the Prospect Medical Holdings, Inc.-owned acute care facility. Members of the organizing committee who spearheaded the union drive are looking ahead to first-ever negotiations with the for-profit company's local Eastern Connecticut Health Network (ECHN) management. "U & I in Union:" Beating the Same Forces "Coming After Us"
Dr. Martin Luther King, Jr. in his famous Letter from a Birmingham Jail wrote that "injustice anywhere is a threat to justice everywhere." The civil rights leader's statement on the value of solidarity remains true today, especially for immigrant communities. We're sharing an example of a higher education professional engaging union members in direct action to win justice for a student's family threatened with being torn apart by deportation.